I love back to school supply shopping. I continue to do it even though it’s been years since I was in school. In these examples I’ve kept the species separate. But feel free to mix up the birds and the bees. FIG. 1 Supplies: glue, detail scissors, X-acto knife, printout, baker’s twine, markers, pencils, masking tape, waxed or parchment paper, glue brush, trimming (ribbon or crepe paper), and poster board. I used 3-ply and it was a little hard to cut. Use thinner board if you are not comfortable with the X-acto blade. FIG. 2 Roughly cut around one of each animal from the printout. Glue them to the board. Spread the glue around with a brush to get it right up to the edges. Press the board between parchment paper, under a heavy stack of books until the glue is dry. FIG. 2 Carefully cut out the other half of the animals. FIG. 3 When the glue is dry, use the X-acto knife to cut out the animals mounted on the board. FIG. 5 You should have two of each animal cut out. One of each, mounted on board. FIG. 6 Glue a 4” piece of twine to the back of each animal mounted on board. I generally had the string attached somewhere near the animals head. FIG. 7 Brush an even coat of glue all over the other half of the animal and pinch the two sides together. Put them back between the parchment paper, under the stack of books. FIG. 8 When the glue is dry, trim any edges where the layers don’t match up, with the knife. Color the edges with a marker. FIG. 9 Nine two-sided animals on strings. 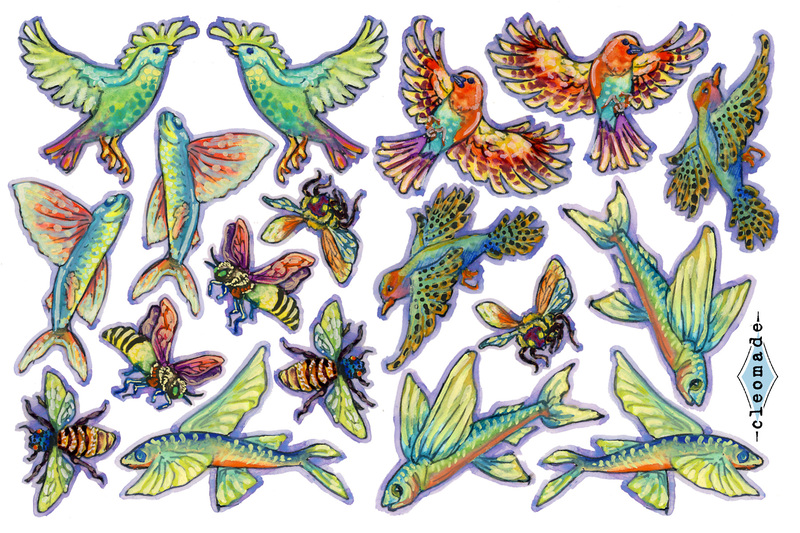 Hey, these would make nice bookmarks. Just tie the string to a strip of cardstock with a hole punched in the end. Cute coordinated school supplies! FIG. 10 lay the pencil down on a piece of masking tape, sticky-side-up. Arrange the strings on the tape so there is a short, medium, and long. Space them evenly so they will end up on three even sides of the pencil. FIG. 11 Wrap the tape around the pencil. You may have to trim one end of the tape first, so it doesn’t stick to itself. FIG. 13 and FIG. 14 Twirl the pencil to get the birds flying around like a carnival ride. Now, sharpen the pencils and smell, mmmmm back to school smell.